Will Harris' multiraciality give her an advantage over other candidates? Thanks to her views on immigration policies and reform, Democratic senator from California Kamala Harris has a promising fan base in Jamaican and Indian communities across America. 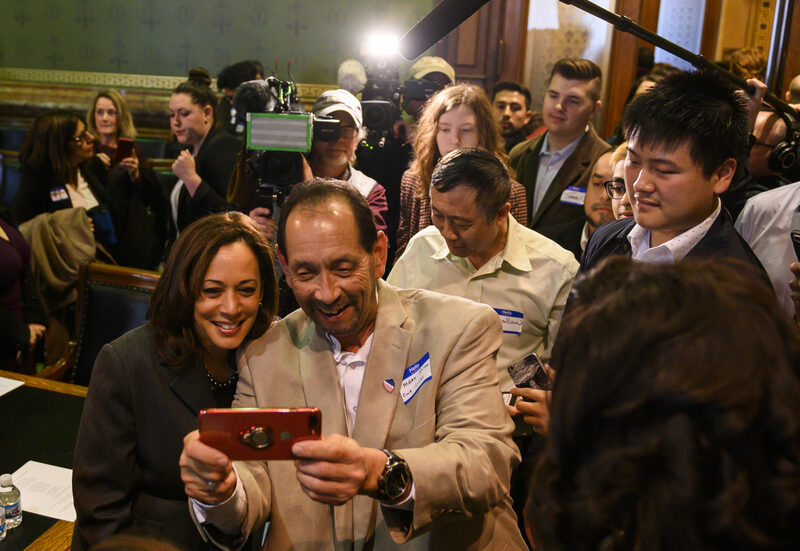 In recent months, growing groups of Harris supporters from various ethnic and cultural backgrounds have started sprouting up across the nation. Their sole purpose is to get her elected in the 2020 presidential race, on a platform of unity through diversity. They feel that she is the candidate that bests represents all people, because her own background includes traces of several continents: Africa, Asia, and Europe. Supporters feel a kindred cultural spirit and it may translate not only into votes during election time, but key pockets of fundraising. “She’s our DNA, so we are excited. I’m sure it’s how the Catholics must have felt when Jack Kennedy was nominated and became president,” Ramesh Kapur, a longtime Democratic donor, told CNN. Kapur is also planning a fundraiser in Harris’ honor to he held on April 28 in Cleveland, Ohio. Miramar, Florida’s own Dahlia Walker-Huntington, also tells the news outlet that Harris’ potential candidacy has “lit a spark in our community.” Walker-Huntington hosts a WhatsApp message group, where she notifies dozens of contacts around the country the happenings on Harris, and how to support the potential 2020 POTUS candidate. Much like Harris’ late mother, Shyamala Gopalan Harris, who emigrated from India in 1960, and her father, Donald Harris, who emigrated from Jamaica a year later, Walker-Huntington also emigrated from Jamaica 40 years ago. The Harris advocate currently practices immigration and family law in South Florida, and is helping to raise campaign money for the California lawmaker through various grassroots efforts. If elected president, Harris, the daughter of a Jamaican father and an Indian mother would be not only the first woman, but the first Indian American, the first Asian, the first Black woman and the first person of Jamaican descent to ascend to the office.